Thanks to Dr. Cary Chisholm, Scott & White Hospital, Texas for contributing this case. To contribute a Case of the Week, follow the guidelines on our Case of the Week page. (1) Pathologists know the importance of education. Help motivate students in the Detroit Public Schools, who may need an extra push to stay in school and think about attending college. Donate $5.00 or more to the Detroit College Promise, the nonprofit we sponsor, and you will also receive a special saving pass which gives up to 25% off one item at any Macy's store or online on October 16, 2010. PathologyOutlines.com and other sponsors pay all of the administrative costs of this nonprofit, so 100% of your donation is set aside for scholarships. Of course, your donation is also tax deductible as allowed by law. Donate now by clicking here. Your savings pass will be mailed to you separately. (2) For all pathologist / PhD jobs posted between September 13 and December 31, 2010, we offer you a 50% discount on any Laboratory or Dermatology job ads (on DermatologyOutlines.com) posted by March 31, 2011. Just mention that you previously posted a Pathology job ad to get the discount. The patient is a 53 year old man with diabetes, on dialysis for end stage renal disease, with an enhancing mass on his left kidney discovered by abdominal CT scan. 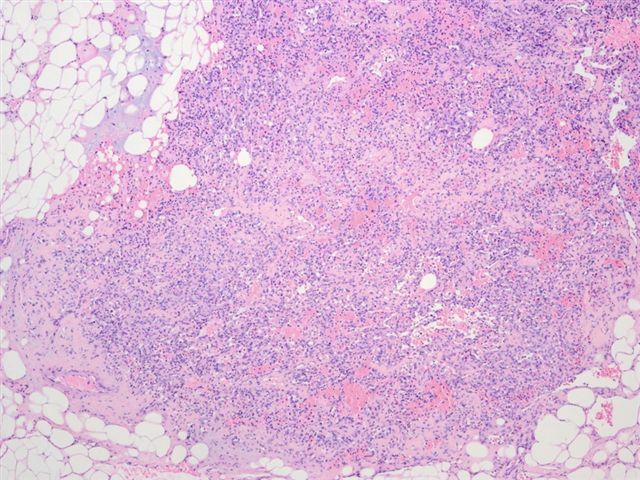 Glomus tumors are composed of modified perivascular smooth muscle cells. 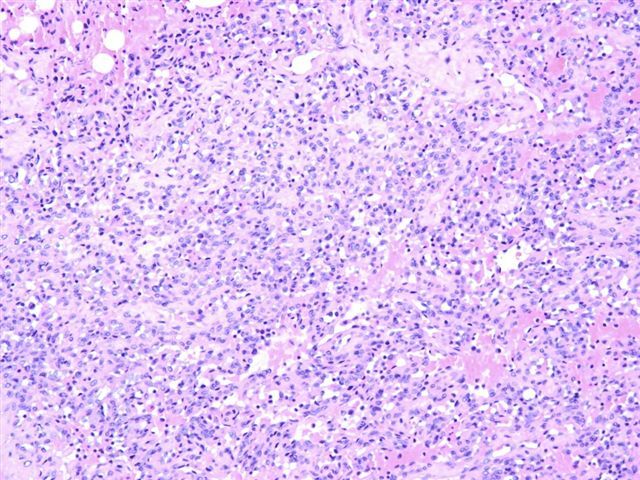 They have a spectrum of histologic types, including glomangioma (more vascular) and glomangiomyoma (with elongated smooth muscle cells). They are most common in the distal extremities, and are very rare in the kidney. 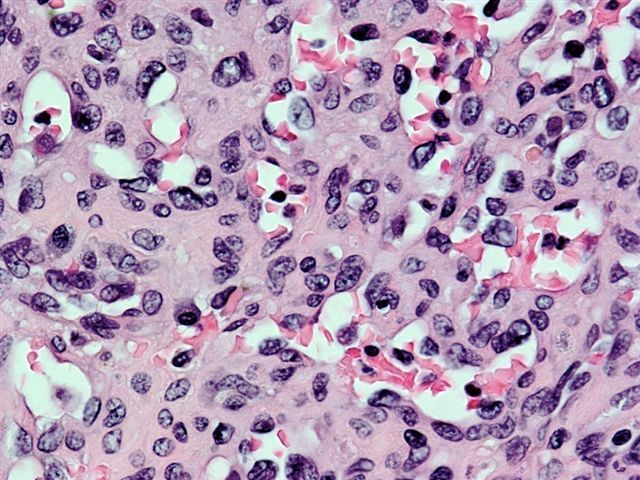 Microscopically, they are well circumscribed tumors, composed of sheets and nests of round, somewhat cohesive cells, that may appear epithelioid. The histologic appearance varies based on the ratio of vascular to glomus cells, the amount and composition of stroma, and the state of differentiation of the glomus cells. 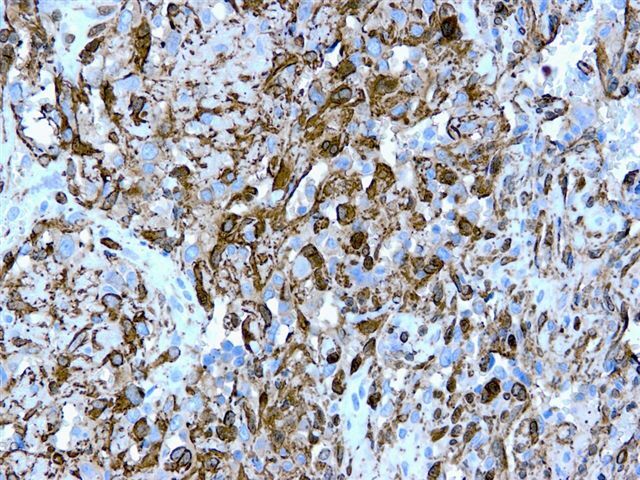 Tumor cells are immunoreactive for smooth muscle actin (as in this case) and vimentin. 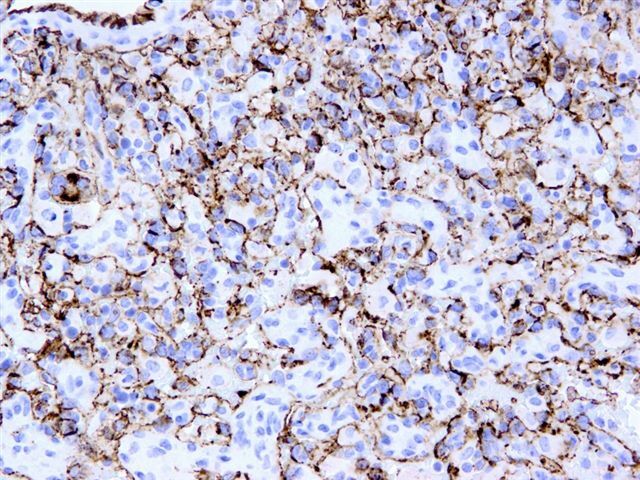 They are negative for endothelial, epithelial, melanocytic and neuroendocrine markers, although some markers may stain entrapped renal epithelium, and vascular markers (including CD31) stain surrounding vessels. Glomus tumors typically have benign behavior, and excision is curative.